The objectives of this event, held on 26 September 2018 in New York, United States of America, were to highlight success stories and provide practical examples of country action. It featured a number of distinguished invited speakers, including WHO Assistant Director-General for Noncommunicable Diseases and Mental Health Dr Svetlana Axelrod, and senior representatives of health ministries from Italy, Portugal and the Russian Federation. A short video demonstrating the Portuguese experience was also shown. Childhood obesity is a major public health problem globally, with the potential to undermine progress towards achieving the Sustainable Development Goals. Prevention is recognized as the only feasible option for curbing the epidemic. WHO recommends that countries establish and expand multisectoral information systems for obesity to aid policy development and track progress. 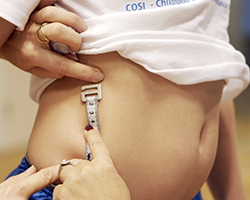 The COSI system provides nationally representative data on overweight and obesity trends in over 300 000 children from more than 40 Member States in the WHO European Region. These data help countries understand and communicate the scale of the problem, enabling them to prioritize obesity and drive more ambitious policy implementation. As the same methods are applied across all countries, findings can also be used to conduct intercountry comparisons. Portugal, a founding COSI member, has been able to use the data to demonstrate that their initiatives and policy actions have contributed to a 7% decrease in overweight prevalence in the last 10 years. Childhood obesity is not restricted to Europe – it is a global phenomenon unequally distributed among countries and population groups. In 2016, an estimated 42 million children under the age of 5 were overweight or obese; almost three quarters of them live in Asia and Africa. As such, country experience from COSI – in generating nationally representative data and helping countries to design, implement and evaluate policies – is an important asset to be shared globally. The European experience shows that it is possible for countries of all sizes and levels of income to take action on childhood obesity. Policies driven by COSI focus on, for example, sugar taxation, better food and more physical activity in schools, marketing restrictions, the adoption of nutrient profiling tools and front-of-pack labelling schemes, active transport plans for children, and commitment to healthy communities. The event was cosponsored by Italy and the Russian Federation. Dr Adalberto Campos Fernandes, Minister of Health of Portugal, and Dr Bente Mikkelsen, Director of Noncommunicable Diseases and Promoting Health through the Life-course at WHO/Europe, were co-chairs.